Download the PDF Censorship and the Internet - Information Brochure (PDF, 167K)* or scroll down to read the HTML version below. The Internet is a fantastic means of communication and source of information. Never before has global communication been so easy and so beneficial. Medical staff can now discuss the latest operating methods with colleagues on the other side of the world, students have several libraries of information at their fingertips and shoppers can purchase exotic goods without ever leaving home. There is however, a small minority of people who use the Internet for harmful illegal activities, in particular those individuals who trade and distribute objectionable material. The Department of Internal Affairs’ inspectors undertake the role of investigating New Zealand Internet websites and newsgroups and enforcing censorship legislation. We take a proactive role to prosecute New Zealanders who trade objectionable material via the Internet. If a publication is categorised as ‘objectionable’ it is automatically banned by the Films, Videos, and Publications Classification Act 1993.
acts of torture or the infliction of extreme violence or extreme cruelty. What are the penalties for possession or trading in objectionable material? Anybody found “knowingly” in possession of objectionable material can receive a maximum of five years imprisonment. Every time a person downloads objectionable material onto their screen, there is the potential for a possession offence having been committed. Anybody who knowingly makes or knowingly trades, distributes, or displays an objectionable publication via the Internet can receive a maximum of ten years imprisonment. A body corporate can be fined up to $200,000. Restricted material is that which is only made available to people who are over a certain age. This includes R18 or Adult material similar to that which can be legally purchased from video or magazine outlets. This material is available on the Internet providing the person accessing it can prove they meet the age criteria. Anybody who knowingly supplies, distributes, exhibits or displays a restricted publication to any person who does notmeet the age criteria is committing an offence. A restricted publication is objectionable if made available to a person underage, and an individual can receive up to three months imprisonment or a fine not exceeding $10,000. or an adult sending sexually explicit text or images to a person under 18. What is the difference between objectionable and restricted material? e) Represents that members of any particular class of the public are inherently inferior to other members of the public by reason of any characteristic of members of that class being a characteristic that is a prohibited ground of discrimination specified in the Human Rights Act 1993. All people who have Internet access through an organisation should be made aware of their responsibilities while on the Internet. For home users, an awareness of what is considered to be objectionable, the type of material that will have an age restriction, and an understanding of the penalties involved will lead to a safer Internet experience. What can I do if I find something objectionable by accident? Internal Affairs investigates and sometimes prosecutes people who deliberately collect objectionable material and find ways to distribute it to other people via the Internet. Occasionally, the nature of the Internet can lead to somebody viewing objectionable material by accident. Remember that everything you read online may not be true. Any offer that seems “too good to be true” probably is. Be very careful about any offers that involve arranging a meeting or having someone visit your house. Think carefully before revealing any personal details such as age, marital status or financial information. Never give out identifying information like a home address, school name, or telephone number in a public message such as in chatrooms or bulletin boards. Be sure you’re dealing with someone that you know and trust before giving information out via email. Make sure that your children understand these rules too. Get to know the services your child uses and find out what types of information they offer. If you don’t know how to log on, get your child to show you. Check with your Internet provider about ways to block out objectionable material to prevent your children from having access to it. Remember that people online may not be who they seem. Because you can’t see or even hear the person it is easy for people to misrepresent themselves. Someone indicating that “she” is a “12 year old girl” could in reality be a 40-year-old man. Be careful if arranging a face-to-face meeting with another computer user. If a meeting is arranged, make the first one in a public place. Never allow a child to arrange a meeting without your permission. Always accompany your child if they do arrange a meeting. Set reasonable rules and guidelines for computer use by your children. Discuss these rules and post them near the computer as a reminder. Monitor their compliance with these rules. Excessive use of online services or bulletin boards, especially late at night, may be a clue that there is a potential problem. Remember that personal computers and online services should not be seen as electronic babysitters. Consider keeping the computer in a family room rather than the child’s bedroom. Get to know their “online friends” just as you would get to know their other friends. Spam Email: The best course of action is simply to “delete” these emails. Never open “attachments” or hit “action buttons” - this could cause the downloading of a virus or could incur costs of a toll call. Often there is a message, e.g. “If you want to be taken off this mailing list, hit the button” - never do this, it will only confirm your email address. 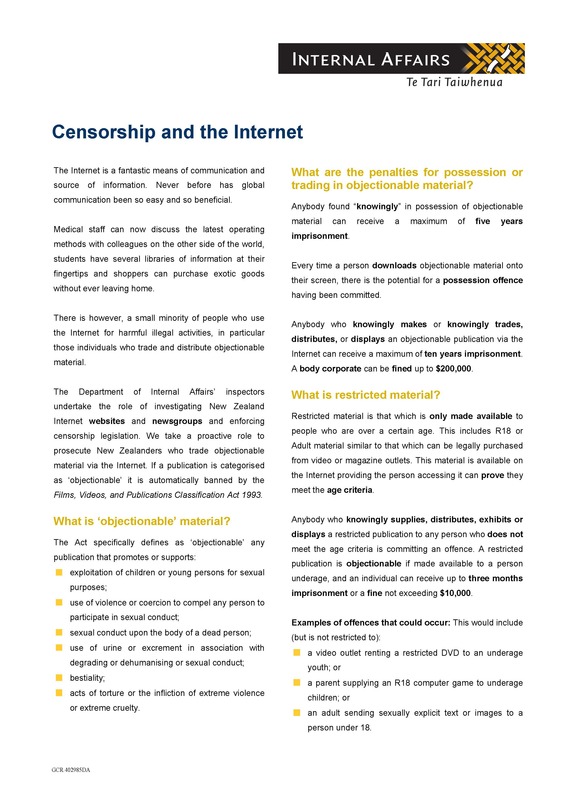 The Censorship Team at the Department of Internal Affairs are available to answer any queries you might have or to provide advice about safety on the Internet.